Chemicals of all types are used in many different occupations such as acids and cleaning agents regularly used in many industrial workplaces. 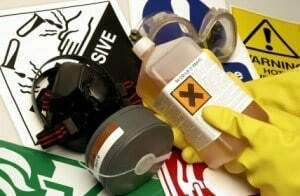 Some of these chemicals have a high risk of injury or even death for the employees that work with them. 12% of the occupational fatalities in 2011 were from chemicals or environmental exposures. It is crucial that employers are providing a safe environment for their employees and protecting them from chemical exposure injuries. Rosenfeld Injury Lawyers LLC helps Illinois workers injured due to chemical exposure recover the compensation that they are entitled to from all responsible parties. If you or a loved one was injured due to chemical exposure at work, contact our office today for a free review of your case with an attorney who will advise you of your legal options--- without any out-of-pocket expense on your end. Eyes. In the study, 30% of the occupational injuries over the 15-year period were to the eyes. Three types of eye injuries are common with chemicals. The most severe is alkali burns, which can cause severe injury to both the internal and external areas of the eye. Acid burns are also serious, however they generally only affect the outer portions of the eye. Irritants are the third type of injury but usually only cause discomfort versus permanent damage. Body systems. Chemicals that are inhaled or ingested can be harmful to almost every function within the body. Depending on the chemical and how it is exposed to the body, there can be long-term, serious effects on the respiratory, renal, cardiovascular, nervous and immune systems. Asbestos is one chemical that is now known to cause mesothelioma and other harmful diseases that are often fatal. Upper extremities or trunk. The hands, arms and torso are all at high risk for chemical injuries; usually chemical burns from chemicals being handled by the employee. Since almost every part of the body can be harmed from chemicals, many injuries that occur have long-term implications for the victims. There can be permanent disability and some effects such as cancer or other organ dysfunction that may take years to surface. The Occupational Health and Safety and Health Administration (OSHA) has strict regulations for employers regarding the handling and exposure to chemicals. If an employer does not provide the proper safety protection for their employees from chemicals on the job, they may be liable for any injury that occurs. Since these injuries can be severe, the financial cost may be substantial and workers should obtain legal representation. Losses that the employer may be responsible for can include medical costs, wages, rehabilitation, plastic surgery as well as pain and suffering. If you or a loved one was injured due to chemical exposure at the workplace, we want to meet with you, free of charge. Rosenfeld Injury Lawyers LLC are experienced work accident injury attorneys that are skilled at obtaining the highest amount of compensation for your injuries. We understand work injury laws and regulations and will use this knowledge to benefit your case. Our attorneys’ work on a contingency fee basis for you and you will not pay for our services unless we win a financial recovery for you.